I am starting a project for my sister-in-law’s husband for our Christmas in July party. I am his Secret Santa this year. I have been wanting to make a Greene & Greene style mirror frame for a while and since the aforementioned individual is a fan of Japanese culture I decided it was a perfect time to start. Also this way I can work out any bugs for future builds. So it is my intent to document as often as I remember and post photos here in this series. I’ll start now and catch up on my progress from the last several weeks of preparation. I started this build on a large sheet of poster paper with a French Curve and straight edge. I did use a photo from the web to get ideas and the basic guide from Marc Spagnuolo’s The Wood Whisperer Guild build. When I finally got the design I liked I then made 1/2 of a paper template and traced it out on some 1/4″ MDF and then jigsawed it out and shaped/sanded to the lines. Then I used the half template to make a full template that would be symmetric about the center line. This was done with the top and side piece since the frame will have top and bottom and left and right symmetry. Next I traced that template to a 3/4″ piece of MDF slightly longer than the actual template and roughly jigsawed it out leaving about 1/8″ material to the line. I did this for both templates. Since the top and bottom of the “rails” are asymmetrical, I made the this template double sided. Next I routed two slots that will hold a T-bolt and knob with a piece of MDF as a backer for the actual work piece. 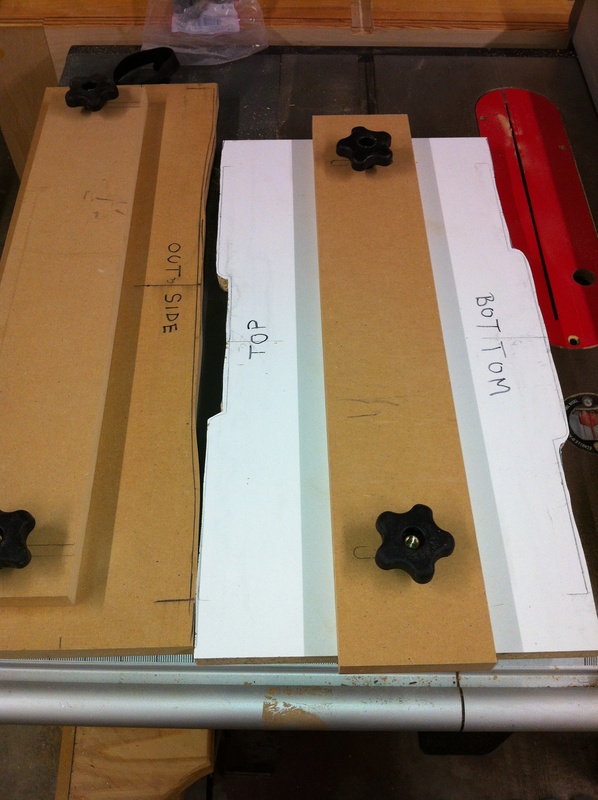 The next step is to add two toggle clamps to each template and finish routing the template to the router template guide. Posted on February 16, 2013 September 5, 2014 by SpunjinPosted in Greene & Greene Frame, Home DecorTagged G&G, Greene & Greene, Mahogany, Mirror frame, routing, template.